October’s Book of the Month is Cuentos Con Cuentas by Miguel de Guzman (Labor, Barcelona, 1984). This is also published in English under the title The Countingbury Tales, translated by Jody Doran and published by World Scientific (2000). 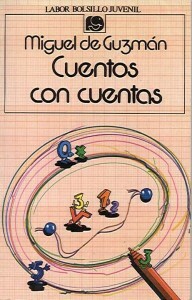 Miguel de Guzman wrote other similar books, the most well known being Aventuras Matematicas which is also published in Chinese, Finnish, French and Portuguese.